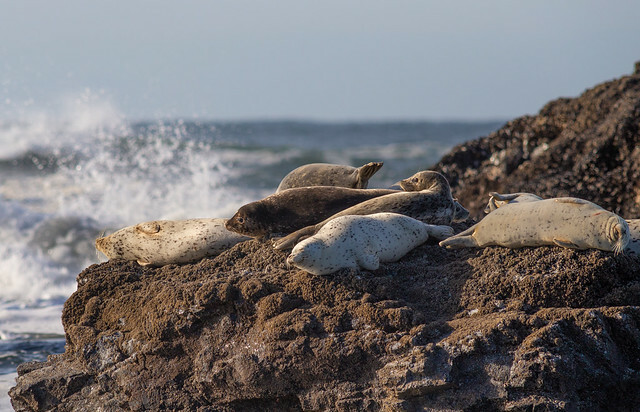 Above: Seals basking in the sun at Seal Rock, OR. December 2018. In a lot of ways not much has changed since my last blog update in March of last year. I’m still pretty busy, and writing for recreation has remained pretty low on my list of priorities. I’m still pretty firmly entrenched in a job where I spend most of my time in the office, or the driver seat of my government rig. My trips to the field have pretty much been reduced to quick visits and daytrips to check on things, and to occasionally help out for an afternoon on special projects. During the 2017 and 2018 fire seasons, I didn’t go on a single fire assignment, on or off unit. Sure, my job entails a lot of fire-related coordination on the local units during the summer, more than enough to keep me busy in fact, but it’s different. I’m not complaining by a long shot, but it has been a pretty significant change in roles and responsibilities that’s taking some time to fully embrace. Anyway… fire season 2018 in a short review. It was a busy summer and fall for me in some ways, and not so busy in others. We had a relatively slow fire season in my zone, although it was pretty busy in neighboring areas. While conditions were primed for a repeat of the crazy 2017 season, we never really saw a lightning event, and for the most part our human starts where are all places where the fire crews could get to them quickly. There was just enough activity, and more importantly, potential for activity, that I never really felt comfortable taking more than a day or two off at a time, and definitely didn’t feel comfortable leaving the zone for a fire assignment. So while it was way less stressful than 2017, and I’m incredibly thankful for that, it was still a lot of work that kept me hopping from July until mid-October. Just getting around from point to point in the huge area I cover proved to be a large workload – by my rough documentation I spent something like 350 hours driving almost 20,000 miles in my government truck in 2018. On the plus side, since I was busy with local responsibilities, the number of nights I spent away from home dropped significantly in 2018, and I’m pretty happy about that. From 2014 through 2017 I was spending 100-150 nights a year away from home, which was becoming a bit tough to sustain, and I’m pretty happy about that number becoming more reasonable this past year. 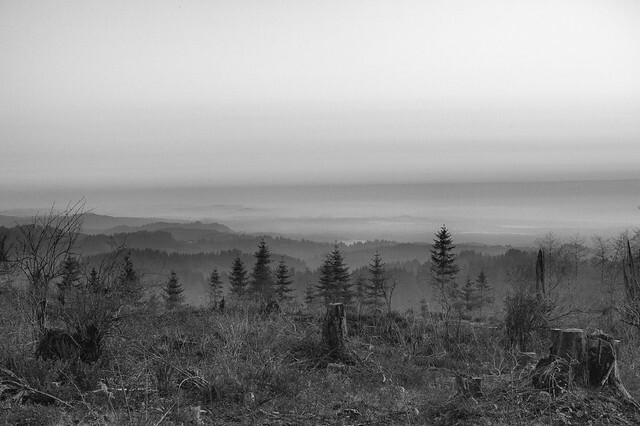 Above: Black and white sunrise over a foggy Oregon coast, near Florence, OR. October, 2018. On the personal side of things, work and grad school kept me busy enough that I really didn’t do much of interest in 2018, or at least much that I want to write about. It was a challenging year for parts of my family, with my last surviving grandfather passing in February, and my last remaining grandmother having a health scare complete with multiple surgeries and a short stay in a nursing home in November. Shoehorn in a delayed memorial service for my grandfather in May and a knee replacement surgery for my dad in October, and it felt like there were a lot of stressful things happening with the Montana side of my family this year. With the way family stuff and fire season kept me busy, I took fewer photographs this year than I have in any year since I started getting into photography in 2010. I did manage to get some images I’m happy with, mainly at the beginning and end of the year, and I’ll share those in a separate post soon. I also didn’t manage any kind of backpacking trip this summer, day hike or overnight, which was moderately disappointing. And in other news… 2018 ended with a government shutdown that continues to this day (day 30 as I type this on 1/21/2019). I’ll probably post about that in a separate post as well, but I’ll just say it hasn’t exactly been a fun experience. That being said, here’s what I look forward to in 2019: Some better alignment of my workload and my personal life goals; some more time spent on photography; the chance of getting a fire assignment or two to work on open taskbooks I have; and the chance to spend some more time exploring western Oregon and Washington. I think 2019 will be a good year, despite the rocky start work-wise, and I’m going to work at making it a good year, come what may. 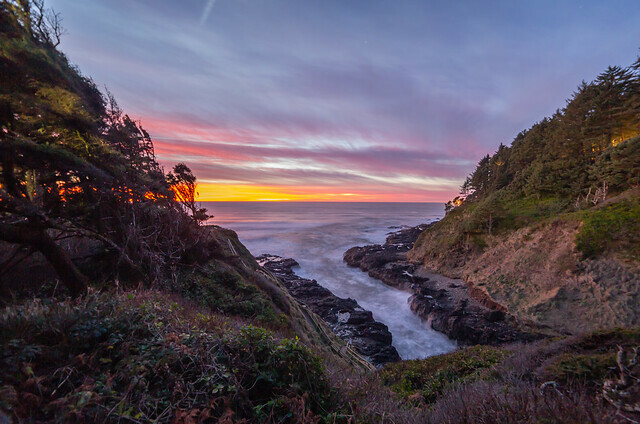 Above: Last sunset of 2018 at Devils’ Churn, Cape Perpetua Scenic Area.